Start off your visit on the 6th (Sat): steep yourself in history at Gobindgarh Fort. Keep things going the next day: take in the spiritual surroundings of Durgiana Temple, take in nature's colorful creations at Jallianwala Bagh, then admire the landmark architecture of Akal Takht, and finally indulge in some culinary diversions at a local gastronomic tour. 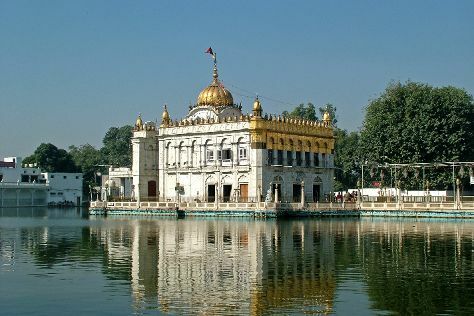 To see maps, other places to visit, more things to do, and tourist information, read Amritsar tour itinerary planner. Coimbatore to Amritsar is an approximately 6-hour flight. You can also drive; or take a bus. Traveling from Coimbatore in July, things will get a bit warmer in Amritsar: highs are around 41°C and lows about 30°C. Finish your sightseeing early on the 8th (Mon) to allow enough time to drive to Dharamsala. On the 9th (Tue), take in the awesome beauty at Triund Hill, explore and take pictures at Norbulingka Institute, and then take in the spiritual surroundings of Jawalamukhi Devi Temple. On the 10th (Wed), you'll have a packed day of sightseeing: relax and rejuvenate at some of the best spas, then explore the activities along Dal Lake, then admire the sheer force of Bhagsu Waterfall, and finally take in the spiritual surroundings of Dalai Lama Temple Complex. To see reviews, maps, traveler tips, and tourist information, read Dharamsala online trip maker . You can drive from Amritsar to Dharamsala in 3.5 hours. Alternatively, you can do a combination of train and taxi; or take a bus. Finish up your sightseeing early on the 10th (Wed) so you can go by car to Chandigarh. Kick off your visit on the 11th (Thu): stroll around The Rock Garden of Chandigarh, explore the activities along Sukhna Lake, then make a trip to Panjab University, and finally browse the different shops at Elante mall. Get ready for a full day of sightseeing on the 12th (Fri): see the interesting displays at Government Museum and Art Gallery, then tour the pleasant surroundings at Chandigarh Fitness Trail & Flower Garden, and then take in nature's colorful creations at Pinjore Gardens. To see ratings and more tourist information, use the Chandigarh online itinerary planner . Drive from Dharamsala to Chandigarh in 4.5 hours. Alternatively, you can do a combination of taxi and train; or take a bus. Wrap up your sightseeing on the 12th (Fri) to allow time to travel to New Delhi. 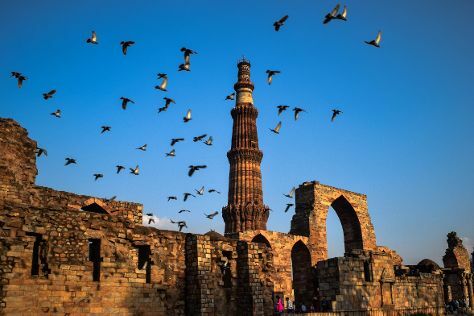 On the 13th (Sat), enjoy breathtaking views from Qutub Minar, then admire the natural beauty at Humayun's Tomb, then don't miss a visit to India Gate, and finally examine the collection at National Museum. Get ready for a full day of sightseeing on the next day: contemplate in the serene atmosphere at Birla Mandir Temple (Lakshmi Narayan), then contemplate the long history of Gurudwara Bangla Sahib, and then admire the natural beauty at Akshardham. To see where to stay, photos, ratings, and other tourist information, use the New Delhi holiday planner . Fly from Chandigarh to New Delhi in 3 hours. Alternatively, you can drive; or take a train. In July, daytime highs in New Delhi are 41°C, while nighttime lows are 31°C. Finish your sightseeing early on the 14th (Sun) to allow enough time to travel back home.